It is common practice to give a horse internal Green Clay treatment whilst healing an external injury with the clay. By giving the horse some clay internally whilst applying external poultices to a wound or infected flesh, you are supporting, boosting and speeding up the healing process. A horse should be fed approximately one tablespoon of Green Clay twice daily for a duration of 2 to 3 weeks. The clay can be mixed into the horses feed. After this period of time stop adding the clay to the horses feed. This detox program can be repeated several times a year to cleanse the horse’s digestive tract or it can be used to directly target a problem that you are trying to heal. If this is the case add clay to the horse’s drinking water too. It is advisable to mix the clay into the feed with your hand and to feed the horse from a plastic container instead of a metal one. Before mixing the Green Clay into your horses’ drinking water, remember that it must not come into contact with metal so as to not lose its ionic charge – the very science that makes this clay such an effective healing agent. So, it is advisable to have a large drinking trough made from plastic for the clay water and to also always have another drinking trough available for the horse containing water without clay. The horse will know when to drink from the clay water and how much to drink. It will also know when to hydrate its system with ordinary water. Never underestimate the natural instinct of your animal and allow it the choice of the two. Fill your plastic drinking through with rain or natural spring water (tap water often has contaminants and when we use it the clay ends up cleaning the water instead of the horses system.) The amount of clay you add to the drinking water depends on the size of the trough, but here is an idea of the ratio: taking a standard 20 litre trough, add 150 grams of Green Clay. Stir the clay into the water with your hand and leave it. A residue of clay will settle on the bottom of the trough. Do not worry about this – the water will be sufficiently charged with a suspension of clay containing all the essential trace elements, minerals, and detoxifying drawing properties you want to give your horse with your first stir. Remember that your clay should never be in contact with metal. 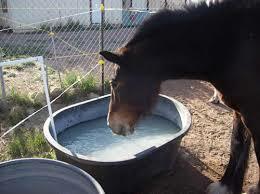 Therefore, do not add clay to your horse's water in anything metallic. A plastic trough, a bucket are great. You can offer your horse a 3 weeks clay water treatment. You can also give him the choice (or not) of both, regular water and clay water. You might be surprised of seeing your friend going for that muddy water. Let's base it on a 15 litre bucket. Add 200 / 250g of clay in it. Fill the bucket when it is empty, with water. Once every 2 days, rinse off bucket and replace clay. It is common to treat internally a horse with an external injury and infection,with 4 times this amount. You can do this treatment as many times as you think is good for your horse trough the year. So many case studies of wounds that would ordinarily have warranted a sad decision of euthanasia have been healed by Green Healing Clay. Those horse owners who decided to go the route of healing their horses with clay – often as a leap of faith into the unknown – have been overjoyed to have their friends alive and well thanks to the clay treatments – however long they took to heal and with virtually none or very little scarring left to tell the tale. Do not use any other anti-septic products in conjunction with the clay treatments. Green Clay is a very strong natural anti-septic. It cleans the wound by drawing the bacteria, pathogens and toxins out of the wound and locking them inside the microscopic chambers of itself. So the nastiness of a wound will be removed with the clay. Do not use any other soaps or alcohol between applications of clay – this will only aggravate the problem. Green Clay does not hurt the horse in any way. When it is applied it feels good – as it does to humans. It has a beautiful cooling effect on hot inflamed infected tissue. The clay is also a natural analgesic so it alleviates a lot of pain. You will see that if a horse is scared of you going near its wound, it is because it is sore, traumatised and scared. Show the horse the clay you want to use to heal its wound. Let your horse smell the clay – gain his trust and then once you have applied the first poultice, every other thereafter will be welcomed by your injured friend. A USEFUL NOTE: Flies are never a problem when using Green Clay as a treatment.